Rachel Harris, sophomore music education major, has made herself known as a rising violinist in the Kansas City area over the past few years. Harris recently performed her violin solo, Violin Concerto No. 3, 1st movement, by Mozart for a master class at the University of Missouri-Kansas City instructed by a violinist from the Philadelphia Orchestra. 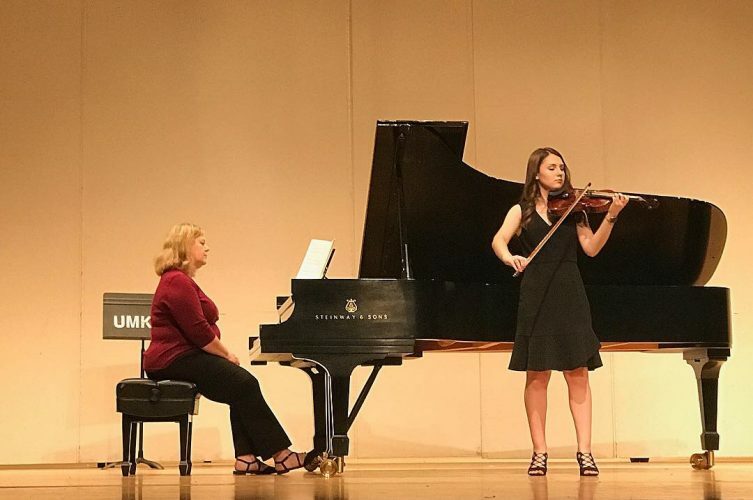 Since beginning violin lessons at the age of six and playing in her first symphony at age 12, Harris has continued advancing her skills and is excited for where her skills and degree will take her in the future. “I believe that my background in music was heavily influenced by my family, because I am actually the fifth generation in my family to play violin. My great-great-grandfather began this legacy, and I actually still have all of the violins. They are a wonderful piece of family history that I can look back on, and some of them are not able to play, but they are great to have because one can actually see the legacy, tangibly,” said Harris. Inspired by her family’s history and the line of violinists that have come before her, Harris has continued to practice and refine her skills with the help of her teachers and professors in order to be able to perform challenging pieces and develop new techniques. Being involved in the Kansas City Youth Symphony allowed Harris to experience what performing in a large orchestra is like, and her current intern position with the Kansas City Youth Symphony has allowed her to begin sharing her knowledge with other young violinists and gain experience for her music education degree. While involved in the Youth Symphony, Harris was able to tour in Ireland and experience how music is perceived by audiences overseas. “That tour really helped to shape me and help me decide to pursue music for my career, especially after seeing how music affects people and how they react to it. I realized that I want other people to share the same joys that I have for music. We played in castles and cathedrals and it was honestly the best experience I’ve ever had in my life,” she said. Harris is thankful to have previously performed in acclaimed venues, such as Folly Theater and the Kauffman Performing Arts Center, which have given her a wide perspective for her personal journey and pathways she could pursue over the coming years. “I am getting an emphasis in orchestra because that is the direction I would like to pursue. My primary instrument is violin so I have chamber music and symphony, which are providing that emphasis. I chose this degree because I have had a lot of teachers throughout the years and I feel like I have gained so many different skills and skill sets from them that I want to able to share with other students, and I also want other kids to take part in the amazing experiences that I have had, even if they don’t choose to advance further in their chosen skills and disciplines. I just want them to experience the joy that music can bring and the self-expression it can provide,” Harris said. Harris hopes to teach middle or high school orchestra in the Kansas City area after she graduates from William Jewell College. She also has already begun teaching students privately in her own studio, which has helped to give her direction for her degree as well. “Right now I have six students that I’m teaching privately. I teach from my house in Blue Springs, Missouri and I have really marketed it to the community and it’s been received very well. We’re planning recitals now and it’s so fun, I truly have a passion for teaching,” she said. Of the numerous pieces that Harris has performed, her favorite to play is the Bruch Violin Concerto No. 1. She performed the piece for her violin audition at Jewell, and also with her high school orchestra as a senior. The piece originally seemed too difficult to master for Harris, but it challenged her to play more passionately and with intensity. “I think it [the piece] has really influenced my playing now. Now that I have challenged myself so far with such a difficult piece, when I look at other difficult pieces of music I’m able to say, ‘Oh, I can easily manage this.’ This piece has been like a stepping stone for me as I have advanced in my skill level,” said Harris. In addition to being challenged by solo pieces, Harris enjoys learning new pieces alongside other musicians in chamber music settings. Harris learned and played the second violin part of the “American String Quartet” by Dvorak last year in the WJC Chamber Orchestra. She was inspired by Dvorak, the piece’s composer, because of the way he captured the audience by combining different musical themes from America into a new work. Harris’ latest accomplishment was performing in a master class at UMKC. The class was instructed by Julia King, associate concertmaster of the Philadelphia Orchestra. Harris had to prepare early for the performance and was proud to represent William Jewell. Harris is thankful for having the opportunity to have performed among professional musicians and enjoyed receiving instruction from such a highly acclaimed violinist. The class allowed her to gain more performance experience and a chance to represent William Jewell with grace and excellence. “When I finally opened up and remembered to breathe, which is something I forget to do sometimes [laughs], I really started to enjoy performing and playing in such a beautiful performance hall. I was very happy with how I did because I was representing William Jewell. It was just a really, really cool experience to have because not many people get to perform in master classes, I was only one of three student performers.” said Harris. Harris has been able to grow as a student, musician and individual while playing her violin and performing in various concerts and events. She is excited to continue advancing as a musician but also is excited to continue teaching violin lessons to young students and to complete her music education degree. Her passion for violin stems from Psalm 150:4, a verse from the Bible that reads, “Praise Him with the Strings.” Harris is excited to continue doing just that.